We are aiming higher this school year! The 18/19 school year will be our biggest year ever! This year we have asked the district to help us reach even more kids. Our goal is to serve 300 or more each week through this school year. Last year, we served an average of 210 per week. West Carrollton Schools not only helps us distribute the food, but they also sponsor a chili cook-off each February and hold a district wide fundraiser each fall. There are also countless staff members who donate directly to us either financially or by volunteering. Miami Township Fire House wins cook off and peanut butter challenge! The 3rd annual chili cook-off to benefit Pirate Packs was a huge success. Over $1800 donated as well as more than $500 in food donated. The district challenged each fire house to bring peanut butter and Miami Township won that contest. Overall, more than 300 jars were donated. Thank you to the fire houses of West Carrollton, Moraine and Miami Township for all you did to make this event a success. Thank you to the staff of West Carrollton City Schools for hosting us and providing such a great atmosphere to celebrate the work of our charity. At the end of the night, Miami Township was awarded the coveted best chili trophy. Pirate Packs has added three dynamic new board members. 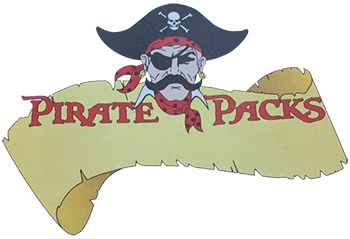 Bill Caissie, Jennifer Stanton and Anita Schaengold accepted the call to join our leadership team as we strive to take Pirate packs to the next level in service to the kids and families in our community. Food Donations save us more than $2000 a year in food cost! We recently received food donations from Moraine Rotary and through a small group within Fairhaven Church. We also have regular contributions from West Carrollton Memorial Methodist Church, West Carrollton Nazarene, Miami Shores Baptist, Valor martial Arts, Cantebury Court, and West Carrollton YMCA which also provide monthly help. These donations save us thousands of dollars over the year. We thank all of you who help us in this way. Pirate Packs accepts nearly $3000 from West Carrollton Schools! West Carrollton Schools collected donations from staff during their annual charity campaign. More than 100 staff contribute either through payroll deduction or by giving a one time direct contribution during this month long event to raise awareness throughout the district. The Montgomery County Health Department has awarded Pirate Packs with a grant to continue to serve 100 kids per week. The grant provides $3 per week per kid for 100 kids and totals nearly $10k a year in assistance to our charity. We are hopeful that this will be an ongoing help to us for years to come.